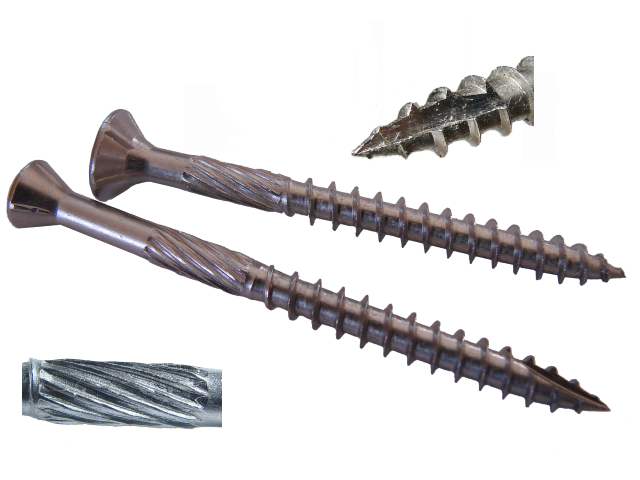 Construction screws and bits - The Online Fence Store. We carry a wide variety of screws for almost any project. We sell screws by the pound and bulk box. Visit our Fastener Information page to learn about the features that make our screws superior to the competition. 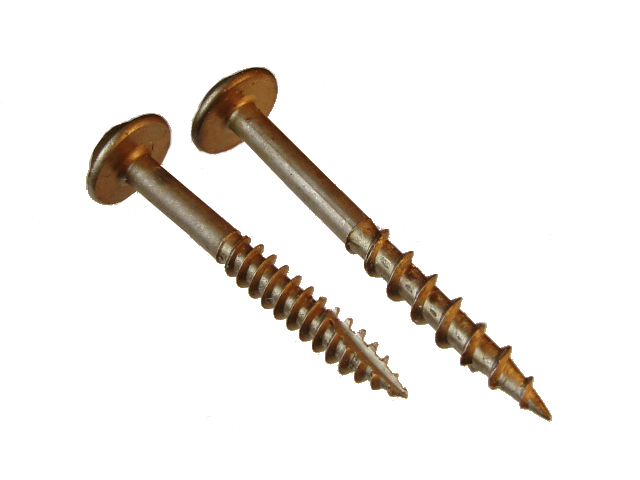 Our Bronze Star wood screws are an excellent choice for use in treated wood. They are well designed for exterior use. Bronze Star screws work great with either hard or soft woods. They have a 1200 hour corrosion resistance in both ACQ and salt spray. And, these screws have outstanding abrasion resistance. High quality steel - heat treated and hardened. Deep wide threads provide maximum holding power. Sharp threads that cut cleanly and easily. 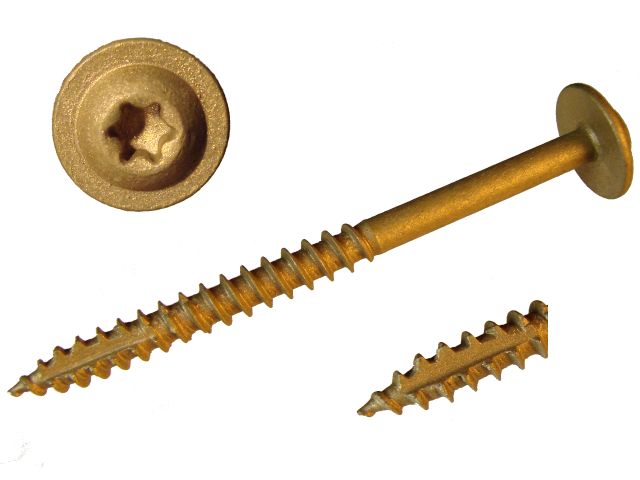 Our Gold Star general purpose screws are an excellent fastener for both hard and soft woods. They can also be used on chipboard and other tough materials. 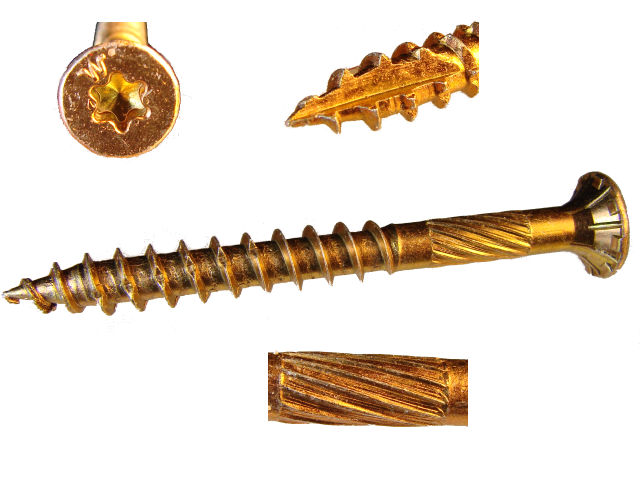 Gold star screws share many of the benefits of our Bronze Star screws but at a lower cost. They are designed for interior work. Our Construction Lag Screw is a superior alternative to the common lag screw. These screws are heat treated and hardened. They are stronger and more durable than ordinary lag screw. They have deep cutting threads for quick easy driving. 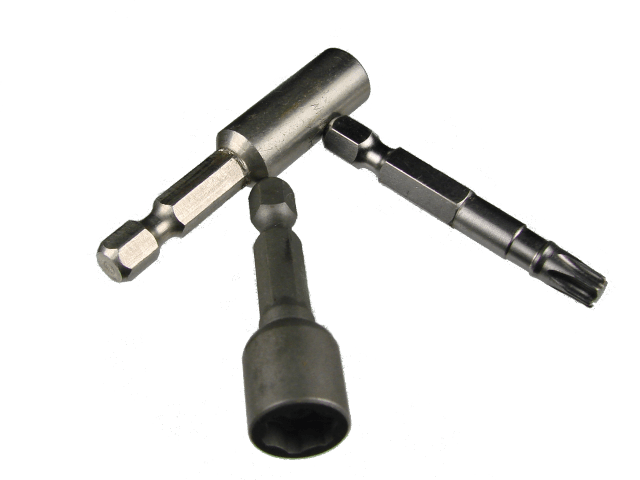 And they have a sharp notched point for exact and quick starting.The built-on round washer head with smooth edges gives the finished product a professional look. Our Silver Star stainless steel screws are an excellent choice for applications that require maximum resistance to corrosion and staining. They are excellent for use in cedar and redwood privacy fencing. And, if you live in marine areas these are the screws for you. They have a 1,200 hour corrosion resistance in salt spray conditions. Over time they will form their own oxidized protective coating. Passivated grade 305 stainless steel. Type 17 notched extra sharp point. 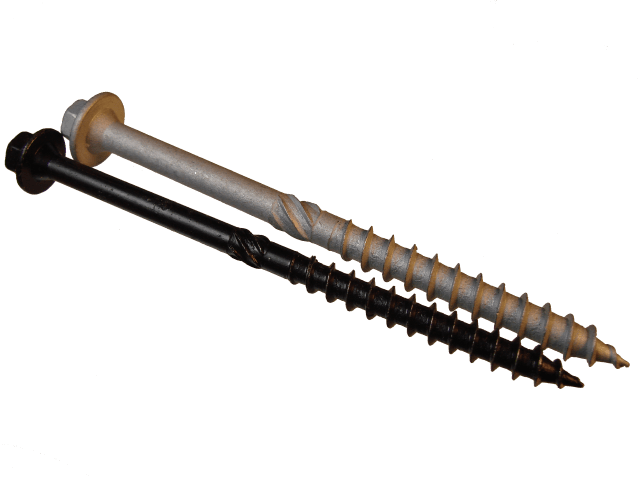 These reusable, heat-treated and hardened black log and gray structural screws install faster and easier than spikes and have much greater holding power. For use with large timbers, logs and in landscaping applications. 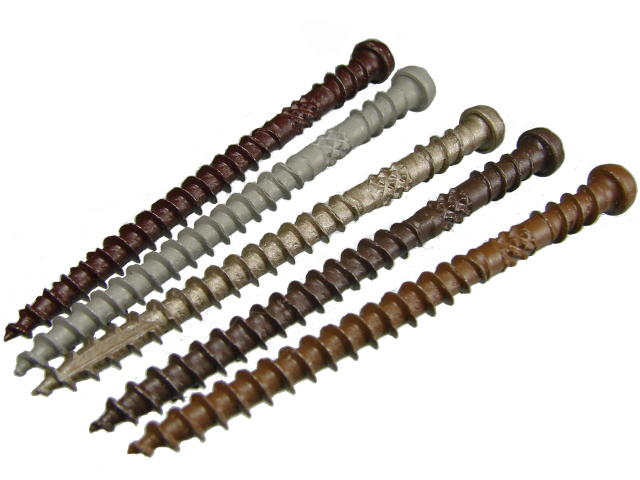 All of our Black Log and Gray Structural screws have a 5/16" Hex Head. 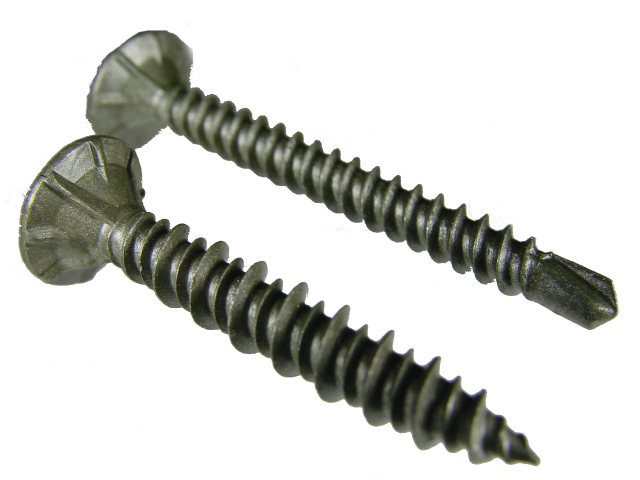 Cement board screws are used to attach cement, backer and tile board to wood or steel. They are ACQ compatible and ceramic coated. They are available in both self-drilling and sharp point styles. The counter-sinking heads provide a clean, smooth finished surface. Pocket screws are excellent for all cabinetry and woodworking projects. Made out of high quality heat treated steel. The type 17 notched tip starts cleanly without "walking". Available in both fine and coarse thread styles. Deep wide threads provide maximum holding power. Wide truss head holds tight. For both hard and soft woods. 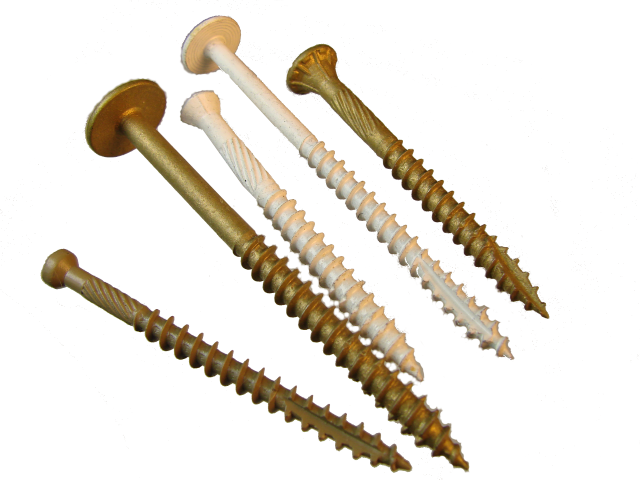 Our C-Deck composite deck screws help to reduce the "mushrooming" of composite material. They also work well with wood where the top threads help to pull down and lock together warped lumber. They feature a triple ceramic coating with excellent corrosion resistance. 1,200 hour corrosion resistance - ACQ and salt spray. Reverse top threads help to reduce mushrooming. Star drive reduces cam-out and increases bit life. We carry genuine Torx bits. They come in assorted sizes and lengths. There are many types of screw heads available but nothing comes close to star drive fasteners. They provide much for torque than phillips or square drives. And, when using genuine Torx bits you can expect excellent bit life. Our genuine Torx bits are available in both standard and impact styles. We also sell bit-holders and nut-setters.